Have you ever imagined something only to find that reality doesn’t add up? That’s how it has been with this sweet potato ravioli recipe. I’ve wanted to nail it for years. I’ve tested it with ricotta cheese, added cinnamon then omitted it, altered the amount of Parmesan, and tweaked the pasta recipe over and over and over again. Each time, before I begin to make it, my mouth is salivating over just how good it’s going to be, and that first bite, every time, is just OK. It’s terribly disappointing. Yesterday, I decided that I was going to give sweet potato ravioli one last chance at being great before I devoted my energies to other pursuits. Having exhausted my ideas for giving it that much-needed oomph, I consulted one of my favorite cookbooks, Marcella Hazan’s Essentials of Classic Italian Cooking for inspiration. The fact that this tome included a recipe for sweet potato ravioli gave me some hope that it was indeed worth finessing, but I was instantly disappointed when I read that she added pancetta to the filling. To be clear, I wanted fabulous ravioli, but I spend a lot of time shopping for food and did not want to go to the grocery store yesterday afternoon. Standing in front of my open refrigerator and hoping for inspiration to strike, I noticed country ham. I had used the country ham to make these for a baby shower on Saturday, but as luck would have it I had leftovers. With country ham in hand, things started to come together. The ricotta cheese I bought would be saved for another purpose, I’d increase the Parmesan, fresh minced parsley would be added to my pasta dough, European butter used for the sauce, and in one last nod to the South, toasted pecans would be chopped and scattered over the top. The clouds parted, angels sang, the water boiled, and a bowl of these sweet potato ravioli drizzled with brown butter infused with sage landed on my table. And in that first bite, I knew I had my recipe. Enjoy; no tweaking necessary. 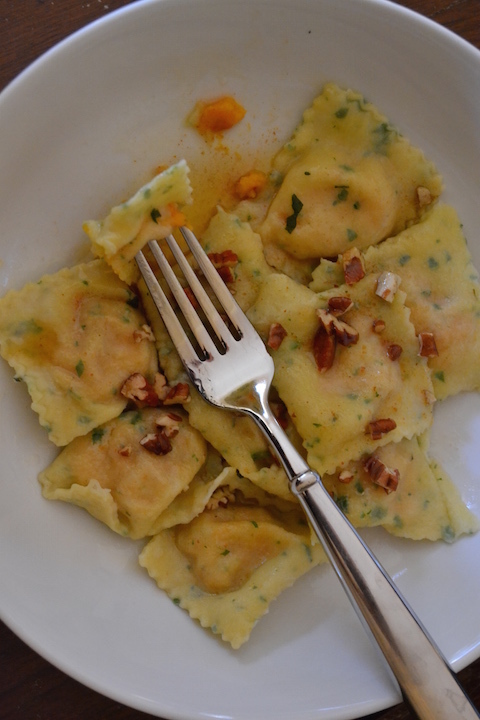 In Essentials of Classic Italian Cooking, Marcella Hazan adds pancetta to her sweet potato ravioli. While I did not have any pancetta on hand, her suggestion inspired me to use country ham in this dish. While I’m sure pancetta would be equally delicious, I’ll happily keep it in the South and continue to use salty and flavorful country ham in this recipe. Don’t omit the pecans. They pair wonderfully with the sweet potatoes and provide nice crunch to the dish. Preheat the oven to 400 degrees. Pierce the sweet potato with a fork and place on a small baking sheet. Roast the sweet potato for 1 hour or until tender. Remove from the oven and let cool. While the sweet potato is cooking, make the pasta. Combine the all purpose flour, the semolina flour, and the salt on a clean countertop. Create a large well in the center of the flour and crack the eggs into the well. Add the olive oil and minced parsley then use a fork to incorporate the eggs and olive oil into the flour until a lumpy dough forms. Using your hands, knead the dough, adding more all-purpose flour (if too wet) or water (if too dry), until the dough is smooth and elastic. This will take about 8 minutes. Wrap the dough in plastic wrap and let it rest in the refrigerator for at least 10 minutes. Bring a large pot of generously salted water to boil. Scoop the flesh of the sweet potato into a large bowl and discard the skin. Whisk in the Parmesan cheese, finely chopped country ham, and egg yolk. Season to taste with the salt, pepper, and nutmeg. Set aside. Once the dough has rested, cut the dough into 6 smaller pieces and then flatten each of them with your palm. Set up a pasta machine and, starting with the largest setting, roll each piece of dough through the machine, dusting the pieces with flour as needed. When rolling the dough on the largest setting, fold each piece of dough in half and roll it through the largest setting one more time. Continue rolling the pieces of dough through the pasta maker using a smaller setting each time. Note: Only fold the dough in half on the first and largest setting. Roll the dough until it is thin, but still easily handled. Dust the lengths of pasta dough with flour and lay the pieces on the counter. Raviolis can be formed in many different ways. Ravioli molds, as well as ravioli stamps, are available in cooking supply stores and are easy to use and make professional-looking ravioli. 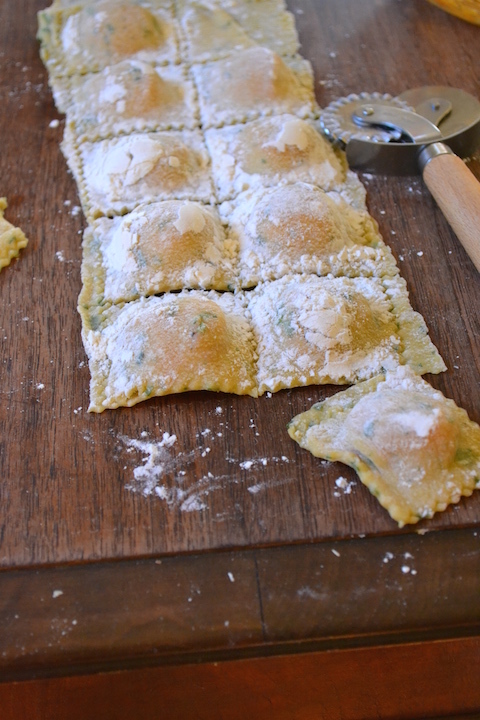 When using a ravioli mold, be sure to dust the mold generously with flour to avoid sticking. While most molds come with a small wooden rolling pin, don’t use this to roll unless you want a big mess on your hand. Instead use it to press the pasta dough together along the edge of each ravioli. Once you’ve completed this step, carefully flip the strip of raviolis out of the mold and use a fluted pastry wheel to cut them into pieces. Repeat until all the pasta and filling has been used. If you don’t have a ravioli mold, ravioli can be made quickly by hand. If making large ravioli, on a well-dusted surface, take one length of rolled pasta and place heaping tablespoonfuls of filling equidistant apart from each other. Then place another length of pasta over the filling and press down gently to cover the filling, remove any air bubbles, and seal the edges. Use a fluted pastry wheel to cut apart the ravioli and further seal the edges. Dust the ravioli with flour and set-aside until ready to cook. Put a large pot of generously salted water on the stove and bring to a boil. Add the ravioli and monitor the heat so that it stays at a strong simmer (boiling the pasta can cause the ravioli to burst open). Cook the ravioli for about 4 minutes or until the filling is hot and the ravioli are al dente. Drain the ravioli carefully and return them to the pot. Melt the butter over medium heat in a small skillet. When the foam subsides and the butter begins to turn golden, add the sage leaves and cook briefly before removing the sauce from the heat. Remove the sage leaves and discard or enjoy as a snack (they are delicious when fried in butter!). 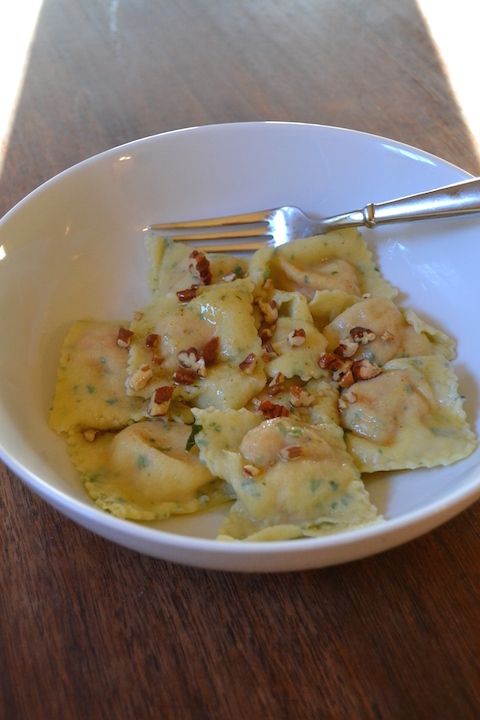 Divide the ravioli between four bowls and sprinkle each serving with the chopped pecans. Drizzle the butter sauce over each serving and serve immediately. This sounds incredibly delicious! A great combo of flavors. Thank you! I hope you give it a try in your kitchen and let me know your thoughts. Wow, kuddos to you for sticking to it till you found the prefect combo!